after an overnight layover in london [that’s what you get when you book a trip to europe on airline points] my italy excursion finally began. i arrived midday and started the trip off properly with some vino and pizza. it was quite possibly the best pizza i have had to date. arugula and prosciutto pizza is my favorite. it could have been due to the overwhelming sense of excitement of being in italy or simply the fact that italians know pizza. the afternoon flew by and it was night before i knew it. i checked into my airbnb and threw on some running clothes and hit the streets of milan. adrenaline must have taken over because i felt as if i could run for days on end. i ran past the amazingly structured milan cathedral, through the incredible shopping center and well, all of milan. i stopped to take in most of the sights only to be bombarded by salesmen. selfie sticks were everywhere i turned and roses were being handed out left and right. at one moment, i was taking in my scenery and the next thing i knew a man was tying a friendship bracelet around my wrist. as he started speaking over the bracelets in a language i could not understand, i quickly tried informing him i had no means of paying for his unwanted gift. i literally had no means. i was out for a run. after giving us the run around [my boyfriend got a bestie band too] he finally believed that we had no money on us and kindly told us to enjoy the bracelets and walked away. next up was a very assertive and complimentary rose salesman who referred to me as shakira. he filled my head with flattery and for a moment, i enjoyed it. as we turned him away all flattery left with him as he filled the next girls head with the same compliments. thanks buddy. the salesmen in italy are relentless. a part of me wanted to purchase what they had to sell because they were so persistent. another part of me was just annoyed. when i returned from my run i showered and got ready for a night on the town. my boyfriend and i were joined by his brother and his brother’s lovely wife. 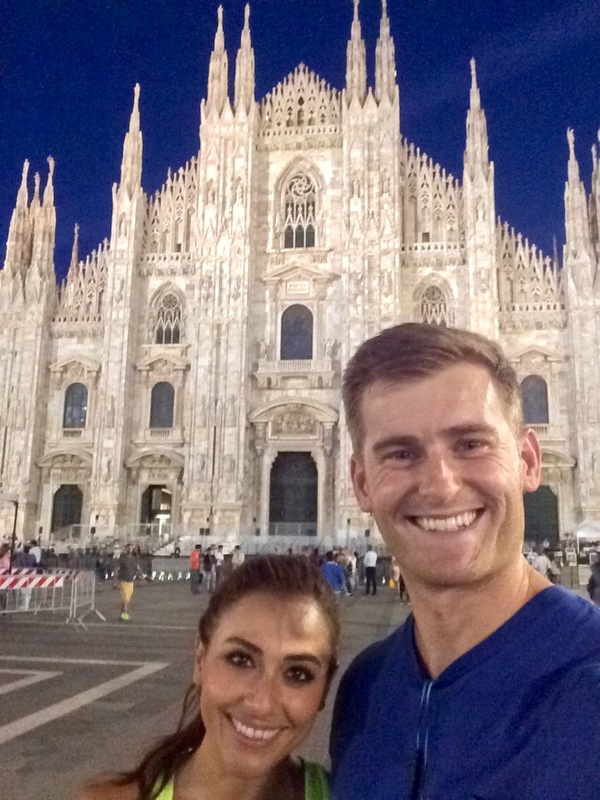 we wined and dined and enjoyed the milan nightlife which is a sight to see. nightlife in milan, from what i saw, was very much a hang out. anywhere there was open space, people were hanging out. everyone seemed to be thoroughly enjoying themselves and getting along. it was great. we shut the restaurant down and got a good nights’ rest before visiting the duomo the next day. the architecture on this stunning cathedral is indescribable. it’s definitely a must see. 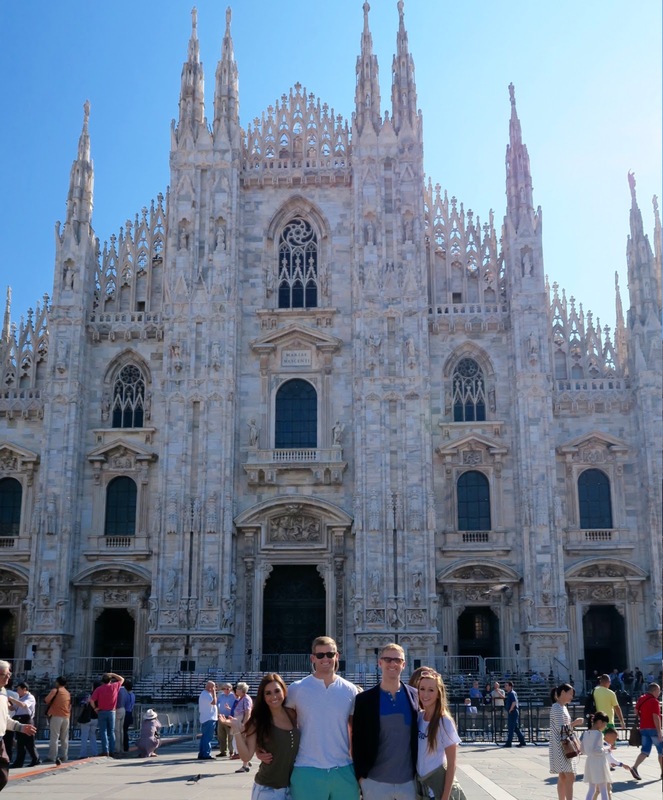 milan was a quick stop on our european adventure but it was the perfect way to kick it off. there are buses that take you straight from the airport to wherever you need to go. use these. there’s no need to be mean to the salesmen. they’re pesky and i’ll agree it gets annoying, but they’re just trying to make a living. if you are uninterested in whatever they are selling, just say no, avoid eye contact and proceed with whatever you were doing. have a glass of wine, do a little shopping and enjoy yourself. don’t feel the need to buy expensive bottles of wine in italy. the house wine every where you go tastes great. pick a night and splurge a little, but don’t feel like you have to every night. your bank account will thank you.